It’s now Day Four of the 2017 Salt Lake Institute of Genealogy, and we’re headed for the final stretch. Thirty top-flight students — engaged and engaging, questioning and searching — have graced the classroom of The Legal Genealogist and co-coordinator extraordinaire Richard G. “Rick” Sayre this week — and it’s been a total blast. But it’s also intensively time-consuming… and that doesn’t leave much room for blog posts. The term of the day. Picked for absolutely no better reason than that it’s the very last defined word on the very last page of the very first edition of Black’s Law Dictionary. Apparently this isn’t a word folks look up on an every-day-every-minute basis. The dictionary website goes on to ask: “What made you want to look up zythum? Please tell us where you read or heard it (including the quote, if possible).”3 And the only interesting answer is that it was the name of a band. Just what in the world is that doing in a law dictionary? 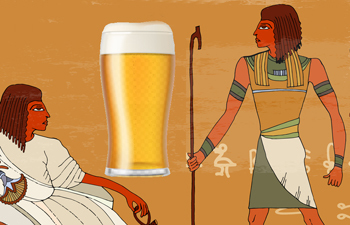 When we’re talking about a beer of ancient Egypt, then what a lawyer of the late 19th century was thinking when he wrote it — well, I have no clue. All the way through to zythum. But what you won’t find, at least not obviously, is any reason why the word was included in a law dictionary. It’s not referenced in any statute book I could find, or any acts of a state or federal legislature, or any decision of a state or federal court. But hey… it’s a fun word, isn’t it? And who knows? Maybe somewhere at some time some ancestor of yours or mine sauntered into that bar, bellied up to the rail and ordered a zythum. And you can just hear the bartender, can’t you? On Google Books there is a book called The Barbarian’s Beverage: A History of Beer in Ancient Europe. On page 70, there is a section labeled “Beer and Law”. It mentions that Roman school teachers used the term zythum in legal texts. Interesting that Black included the term. That dictionary has several references to Zythum in lemmas for other things relating to food, such as bread. I can understand that there would be laws in ancient Rome relating to food, like the food safety laws we have today. The word “zythum” was still the last word in the 4th edition of Black’s Law Dictionary. For those wanting to know more, The Barbarian’s Beverage: a History of Beer in Ancient Europe by Max Nelson might be in order. I haven’t read it and probably will not. My genealogical reading list takes all of my time. Hmmm. My very first notion was that a legal fellow was demonstrating his edjimicashun… and then others simply copied. While Egypt may not be a place we readily connect to the slave trade, it is on the same continent. I hypothesis that zythum is a word that was transmitted through interaction with people from other parts of Africa (trade routes, migration, tribal conflict, etc. )and later made its way across the Atlantic. When you consider how language, music, and other customs blended with American ways to create unique slave cultures, such as Gullah or GeeChee, it seems probable. Could also have been transmitted by early Euro explorers/world travelers who had traded for it in Alexandria. I understand all the ways it could have gotten into use in the New World. What I don’t get is how (and why) it got into this one law dictionary. Here is what the OED has to contribute about “zythum”: “1608 E. Topsell Hist. Serpents 62 For the better auoydance & purging out of the digested venome..giue the party Garlicke beaten with Zythum, vntill he vomit.” It is possible Black was having a bit of fun with us. That’s simply hilarious — and yeah, Black may have been having some fun… or padding the product! My copy of Black’s 4th edition has a cite for Zythum: Dig. 33, 6,9, pr. Under Black’s definition for Digest (p. 543) he states: A reference to “Digest,” or “Dig.,” is always understood to designate the Digest (or Pandects) of the Justinian collection; that being the digest par eminence, and the authoritative compilation of the Roman law. So, I guess he spent time perusing the Justinian collection looking for words?